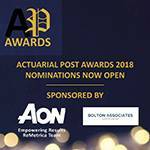 Actuarial Post Awards 2018 - Nominations Now Open! Articles - Actuarial Post Awards 2018 - Nominations Now Open! Welcome to the Actuarial Post Awards. The Actuarial Post Awards are now open for nominations, there are eight awards, including the coveted Actuary of the Year. A month of nominations is followed by the release of 4 nominees short-listed for a round of voting. The winners are then announced in the December issue of Actuarial Post featuring interviews with all the winners. Thankk you for joining us as we continue to celebrate and reward the talent and achievements of individuals in the actuarial arena. Nominations for the Actuarial Post Awards are now open.